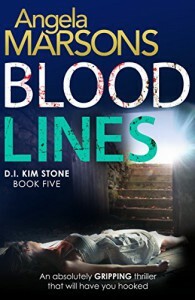 Blood Lines is yet another great book in my favourite crime series. What an intense start to this book. I couldn’t turn the pages fast enough. I love the chemistry between the different characters within the police team. I found the Dear Diary chapters rather dark and unnerving, and the ending was surprisingly emotional. I really like Kim and I love to hate Alex, with a little more enthusiasm than I thought possible! Although this book can be read as a standalone, I recommend you start this series from the beginning, so that you get to know more about the regular characters in the series. If you really don’t wish to start from the beginning, I would still highly recommend reading Evil Games, which is book two, as we see the return of one nasty character from that book, and I think you will gain more enjoyment from this book if you’re aware of quite how manipulative evil Alex is. I’m confident fans of the D.I. Kim Stone series won’t be disappointed by the fifth book in this series. I would like to thank the publisher, Bookouture for allowing me a copy of this book via Netgalley in exchange for an honest review.